Labor Day Weekend always marks the end of the summer for me as for most as kids return to their studies. Although, officially we still have a couple of weeks left to enjoy the extended daylight, the carefree days of summer seem to abruptly come to an end once this holiday arrives. Although, I secretly anticipate the return of summer, I have learned to embrace each season for their own beauty. As I begin pulling out all the decorations for the fall, I feel an excitement mounting once more for new opportunity to display the wonderful array of colors that fall has to offer from its deepest red to its darkest yellows. I realize that just as in life we must embrace every opportunity as it comes – just as a year unfolds so do our lives. We have seasons of rest, pruning, and times of great productivity. But within each season of our life there is beauty to behold; no period is less important or beautiful than any other. The arrival of autumn is more satisfying to me with each passing year as it mimics my life with PD. Autumn like Parkinson’s has the ability to draw from a wide spectrum of brilliant colors painting the panorama with an impressive display of colors which summer will never see. As I near the end of summer in my own life, living with PD I am discovering a new range of talents never once displayed along with a burst of creativity I never knew I possessed until it was ready to be harvested. Despite the fact that it takes me longer and requires more effort on my part, at least a lot more dopamine plus a few chocolates here and there, just to be able to take things out from storage and begin preparing the home for its seasonal-fall make over, I would not change a thing. there’s nothing like the aroma of cinnamon pumpkin, sweet candy apple, and candy corn intermingled to liven my spirit…crisp apple soaps to awaken the senses of even the sleepiest of us all. I absolutely love the lingering aroma of fresh citrus fruits on my hands all day especially since I constantly wash my hands. 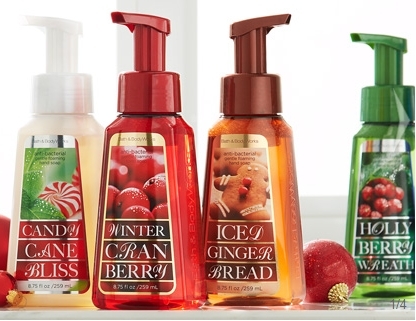 This is the season, I particularly look forward to visiting my favorite store – Bath & Body works! I enjoy walking into the store to find new novelties and even though my smell is not what it used to be the combination of aromas always stimulates my olfactory nerves so that I feel almost normal. This comment of course swelled up my chest with a great sense of pride since as you know we all have good days and bad days and sometimes domestic diva goes on vacation for a day or three! Nice to know that my home is still inviting despite my shortcomings. The candles and soaps provide wonderful soothing aroma therapy to help relax anyone but especially us Parkinson’s patients and relieve anxiety due to stress. The best thing of the season, however, is the glee in my daughters eyes when I get done with all the decorating..a lot of which came from my favorite store in the form of unique little Halloween houses, Pumpkin soaps, and owl night lights. Plus, you can choose from a wide range of seasonal easy to carry hand sanitizers which aside from smelling terrific are fun, a good conversation piece, great little gifts, and a must have for any woman especially for those of us who are already predisposed to other illnesses and experience worsening of our PD symptoms with any cold or flu. Prevention is still the key to a healthier living as the season gets rolling and flu season draws near. But with one stop shop you can relax, distress, improve your senses and prevent spreading of viruses! Wow, you are now on your way to embracing the fall season the PD Diva way!